Iran has been a fairly marginal player in the South Caucasus, but both Armenia and Azerbaijan are competing to draw it into the region. On its heavily fortified border with the Islamic Republic of Iran, Armenia is developing a new strategy to overcome decades of economic isolation. But a bit to the east, on its own border with Iran, Azerbaijan is endeavoring to thwart Yerevan's plans. Last December, Armenia opened a free economic zone (FEZ) in its southernmost city of Meghri, on the Iranian border. The zone aims to take advantage of the Iranian market and position Yerevan as a broker between Tehran and the Eurasian Economic Union, the Russia-led trade organization of which Armenia is a member. The trade could be mutually beneficial: The Islamic Republic has long expressed interest in expanding trade links to Russia via the EEU, and Iran offers just one of two borders left open to Armenia after Turkey and Azerbaijan closed their respective frontiers following the war over Nagorno-Karabakh in the early 1990s. Trade between Armenia and Iran has been growing annually, reaching $211.4 million in 2017. 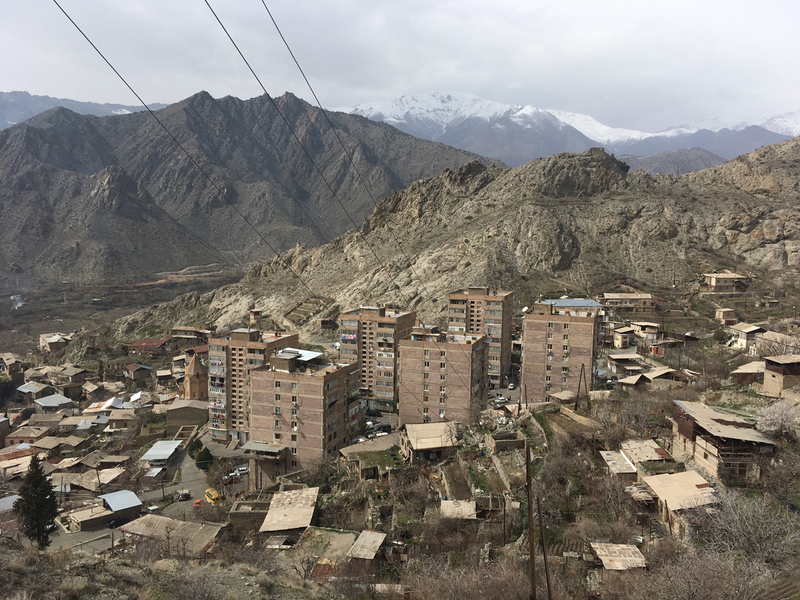 In Meghri, the influence is evident. As you wind down the dusty roads to the border, Persian script covers billboards by the side of the road: “Happy Nowruz” they say, referencing the Iranian New Year. And locals have a generally positive view of their neighbor to the south. The Iranian side is also positive about developments on the border. “The launch of the Meghri Free Trade Zone will be conducive for economic turnover between Armenia and Iran and the exchange of experience with Iranian free trade zones,” Seyyed Kazm Sajadi, Iran's ambassador to Armenia, said at the opening. The conditions in the zone are certainly generous. These projections are ambitions. Armenia’s other two economic zones, the Meridian and Alliance FEZs in Yerevan, established in 2014, have between them created just 94 jobs and garnered interest from 17 companies. Two of those suspended their activities last year. And the Meghri FEZ is being launched even as another ambitious Iran-Armenia trade project, the Southern Armenian Railroad, has stalled. “In 2016, after the Iranian government and China held negotiations to construct a new railway between Iran [and] Armenia, Azerbaijan (unofficially) threatened to freeze its loans to Iran,” Fuad Shahbazov, a political analyst based in Baku, said in emailed comments. In January, Tehran accepted a $500 million loan from Baku to construct a 205-kilometer railway from Rasht to the Azerbaijani border (known as the Rasht-Astara line). Then in March, the foreign ministers of Iran, Turkey, Georgia, and Azerbaijan all met in the first-of-its-kind quadrilateral meeting. There’s also a strategic imperative. A major security concern for Baku is its exclave of Nakhichevan, which, since the war with Armenia, has been only reachable by air. Baku sees the potential to expand the recently launched railway between Nakhichevan and the Iranian city of Mashad, linking it to Azerbaijan’s main railway network. But Armenians hope that the new trade zone in Meghri will boost commerce and thus create an economic base for the railway. By developing bilateral trade first, Yerevan hopes then to position Armenia as a major transit hub between Iran and Russia. To this end, the country is also lobbying its northern neighbor Georgia to invest in the Meghri FEZ. On March 2, Georgian Prime Minister Giorgi Kvirikashvili met with his Armenian counterpart to discuss the FEZ. Currently, Armenian trade with Russia has to use the sole remaining Russian-Georgian border crossing at Upper Lars, which is often blocked by snow during winter. The two other roads connecting Georgia and Russia pass through the breakaway regions of South Ossetia and Abkhazia. Both of these roads were closed following the 2008 Russian-Georgian War. Last year, Georgia and Russia signed an agreement to re-open those roads as “trade corridors” – with cargo monitored by a third party, the Swiss SGS company – after years of negotiations between Tbilisi and Moscow brokered by Switzerland. But prospects for Armenian involvement may be limited in the short-term.